I had the same problem. I switch arm so I just went around it and disarmed as close to the ground as possible. Tried this, and it´s very good for Rate or Acro+ but quite dangerous with Attitude if you don´t land on a level terrain (fliped several times). I suspect i know the answer but, is there a way to disable AlwaysStabilizeWhenArmed when using Attitude ? In the current next (and in the next release) you use an accessory channel to enable/disable AlwaysStabilizeWhenArmed, so to have safe landing and take-off. Just red this topic and what a cool feature! Would solve a lot of my fall out of sky problems as even on rate mode when I flipped in air and accidentally lowered the throttle to far the quad had difficulties "regaining" power and giving odd behaviour. Would this setup work of would there be a conflict? Would this also mean once activated and I would land with the quad not perfectly level, one or more motors will continue spinning? Same with takeoff after arming? So I would actually need a 7channel RX and TX because right now I have the arming setting to yaw right at zero throttle. Putting it on a switch I need and extra channel...? About the problem "regaining power" after a drop, this sounds like the "Vortex Ring State" and is not a problem the flightcontroller can solve. You either need to have motors spin while armed. Or.... Setup an idle switch in your radio. That way the lowest throttle will idle the motors. Thanks, hence the topic i guess. Right now the arming by switch does only work to activate the motors not to disarm. When I click the switch back, the motors are still live and ready to take off. So I'm looking for a way to put both options on the same switch, one to arm and activate the alwaysstabilize function and switch back to deactivate both options ( landing ). Right now the arming by switch does only work to activate the motors not to disarm. Set neutral around middle value on Accessory used for arming. Yeah like he said it's all in the neutral point. On my Taranis I use a 3pos switch. I had to make the neutral point of the switch one micro second above the disarm value. And the off position is disarmed. One switch up (middle) is arm. And the 3rd is still armed with an idle around 1050-1060. I was having problems arming and disarming too so I moved the neutral point one above the disarm value. Works flawless. "Zero throttle yaw spins all day". That way the motors won't stop unless it's in the middle position and throttle all the way down. I think the value was 172 in its lowest position. I set neutral value to 173 to reliably arm and disarm. Yeah like he said it's all in the neutral point. On my Taranis I use a 3pos switch. I had to make the neutral point of the switch one micro second above the disarm value. And the off position is disarmed. One switch up (middle) is arm. And the 3rd is still armed with an idle around 1050-1050. I was having problems arming and disarming too so I moved the neutral point one above the disarm value. Works flawless. "Zero throttle yaw spins all day". That's my issue! Thanks for the tips. If I read this correctly unless you activated the always stabilize function you can have also total control as long as the motors turn at idle with throttle to zero. Of course it is t the same as total motor stop but I wonder in flight if one of you guys tried both option, which to prefer or doesn't make a difference in flight attitude. I used to run it with motors spin when armed and no idle. But if you crash it takes a second to disarm. But always stabilized works fine. Now, like it on a 3 position cause I can still stop the motors for safety in the second position and land easily. If you crash, throttle down and switch all the way down. Easy and motors stop instantly. I feel like I have a more control at an idle speed as opposed to just stabilized while armed and motors spin at armed. So I do both. Always stabilized while armed but not motor spin at arm. I do that with an idle on the throttle channel in the radio instead because I like to have an armed and motors not turning and and armed and idle. Had to read that one three times but it's clear for me. 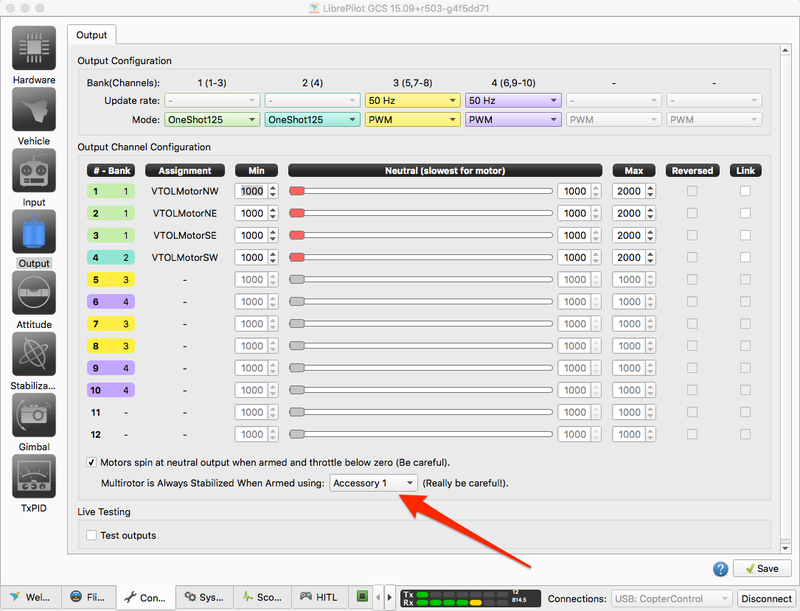 Once it will be updated in GCS Librepilot I will presumably use the same configuration as yours. But if you crash it takes a second to disarm. Oh, well thank you. That's good to know. Well I may try that this weekend. Ok...its initialy set at 1000 ms. Is that Mili seconds? I set it to 10 ms. And that's basically instant to me. Is a small value better than say zero? Would zero make it instant? And the topper... Would the addition of an idle up, "in theory" give "more" control at low throttle? More RPM means more control, right? Yes milli seconds. I would not try to set zero, 10 mS is already instant enough. About higher idle, is something I've ever set, also without AlwaysStabilizeWhenArmed. The downsides are lower descent rate in normal flight and faster descent rate in upside position. But there is no risk of unwanted motors shutdown in critical conditions, and I think the attitude control at min throttle can be better with airmode enabled.